Since we wrote this post back in August, we have begun to wrap our cheeses in French paper, which is quite versatile, easy to use and popular amongst customers. The information contained herein will help you to keep your cheeses lasting for a week or longer in your refrigerator. But we advise to eat cheese within a week of purchase to maintain its freshness of taste. Cheeses arrive at market shipped in whole or partial wheels. Cheeses last longest when they are uncut or cut in larger pieces. 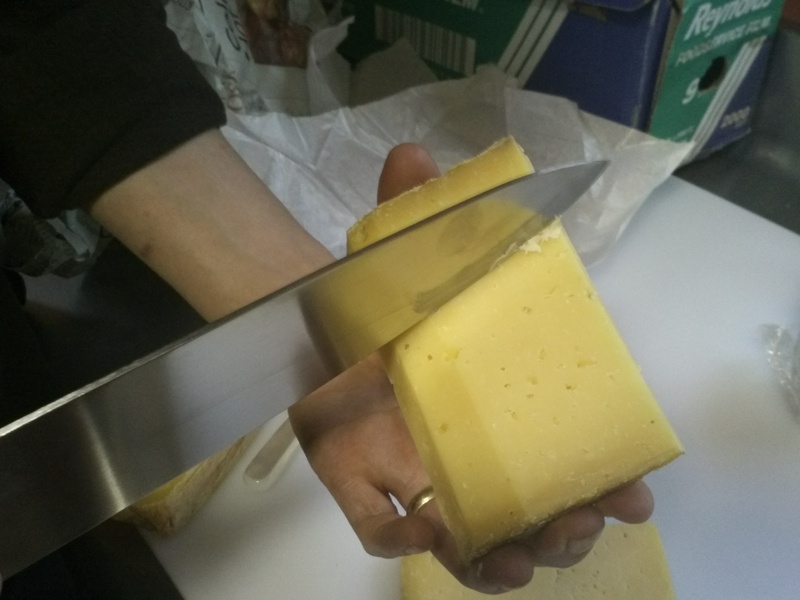 The cheese begins to die away at the cut, so the packaging a cheesemonger uses to wrap the cheese for the customer can retard or exacerbate this process. Cheeses typically need some space to breathe or the natural culture or mold will die away leaving a taste anywhere from ammonia to rubbery dullness. 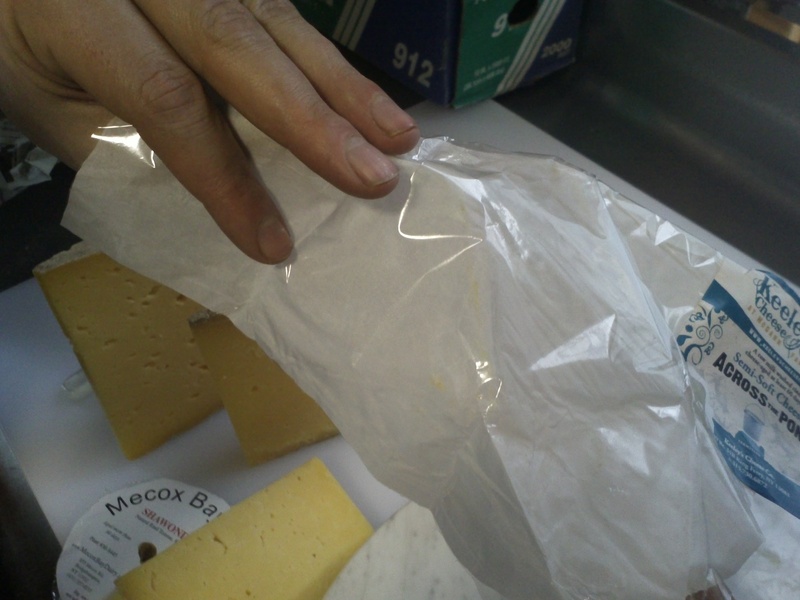 The best cheese shops sell cheese cut-to-order and use a paper/plastic combination wrapping or wax-lined parchment. These types of packaging, of course, are very expensive, and likely the consumer will pay for it in the pricing of the cheese. Nevertheless, they insure the best quality of the cheese. 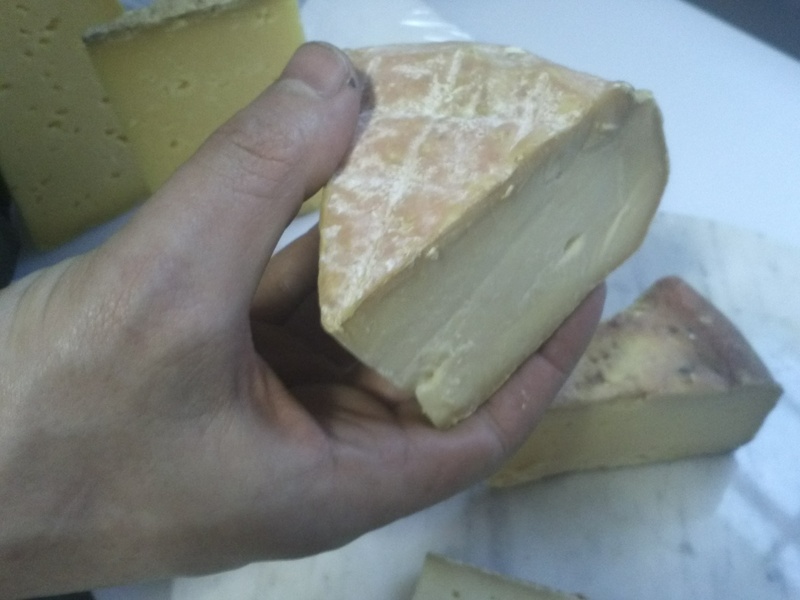 A paper/plastic combo works particularly well for young, bloomy, and washed rind cheeses, such as the New York washed rind cheese pictured below. A properly wrapped and cared for washed rind cheese from central New York. The Long Island washed rind cheese in the background was wrapped in plastic wrap. Notice how its rind is beginning to die away. The same cheese as pictured above. Beautiful! 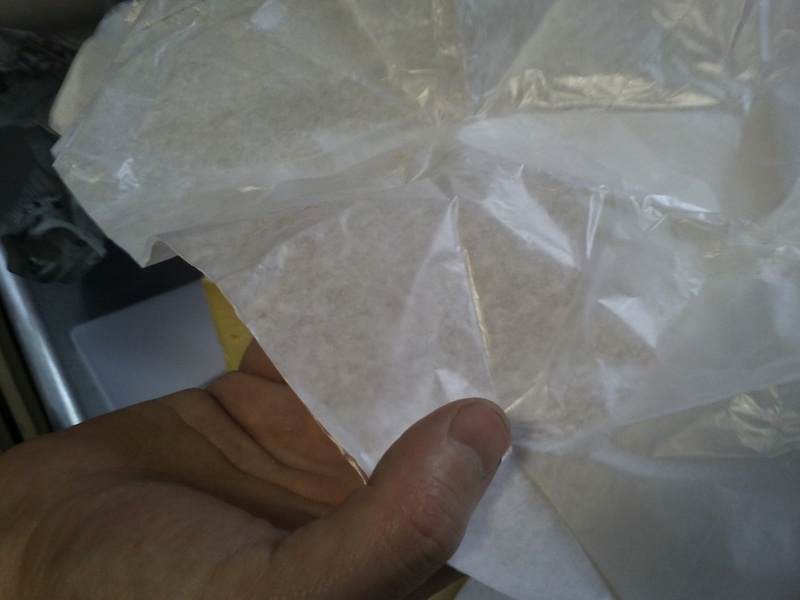 The cheese paper is very thin, almost the width of tracing paper or a heavier tissue paper which keeps the plastic from touching the paste of the cheese. 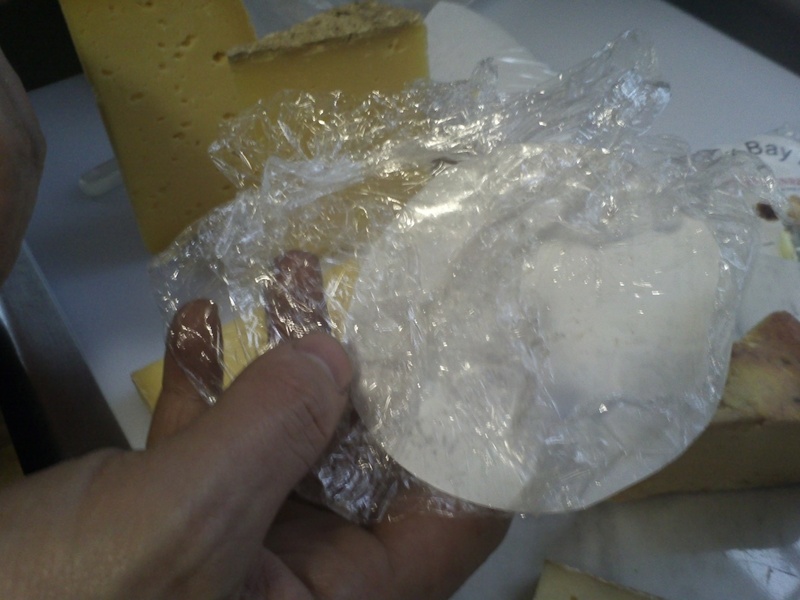 The outer shell of the paper is a “crystal” plastic, a stiff thin plastic that keeps the moisture and culture inside so the cheese does not quickly die off, leaving an unpleasant taste. Another excellent option for cheese paper is a wax-lined parchment, suitable for keeping the cheese stable and the flavor fresh. This is the paper that works best for the greatest number of cheeses, and The Cheese Traveler has chosen this product for wrapping our cheeses. 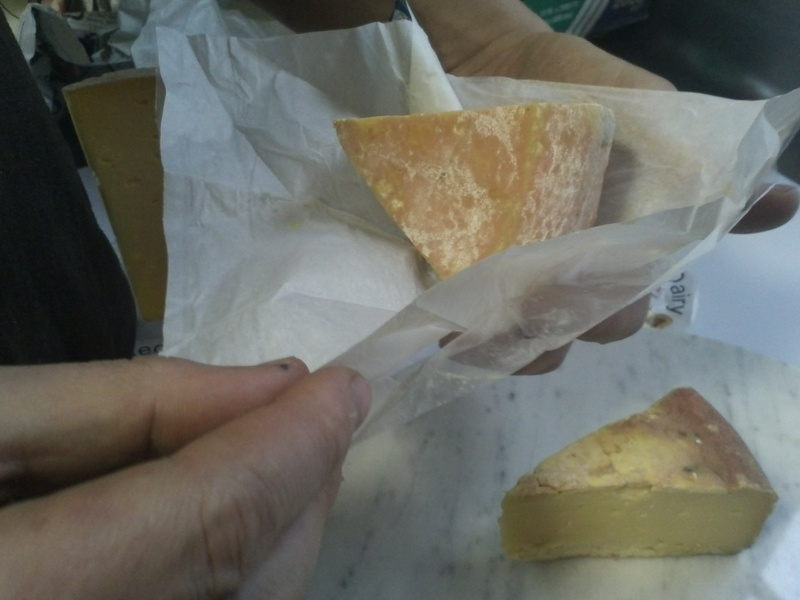 These two methods of wrapping cheese signify best practices and show both knowledge and skill on the part of the cheesemonger. The Cheese Traveler recommends buying cheeses wrapped in this way. The least desirable packaging for cheese is plastic wrap, especially touching the cut face of the cheese. Many commercial stores use plastic to simplify their operations and to cut down on labor costs. The plastic-wrapped cheeses will sit in plastic for weeks and sometimes months. The taste and smell of the plastic soaks into the cheese and alters its flavor. It suffocates the cheese and within a few days will kill off its natural characteristics replacing them with unpleasant flavors. Moreover, the paste of the cheese, like meat, readily absorbs toxins from the plastic, making it an unhealthy long-term packaging option. Young cheeses will very quickly deteriorate in plastic, and the ammoniation from this process that is a byproduct of the dying mold will be released. 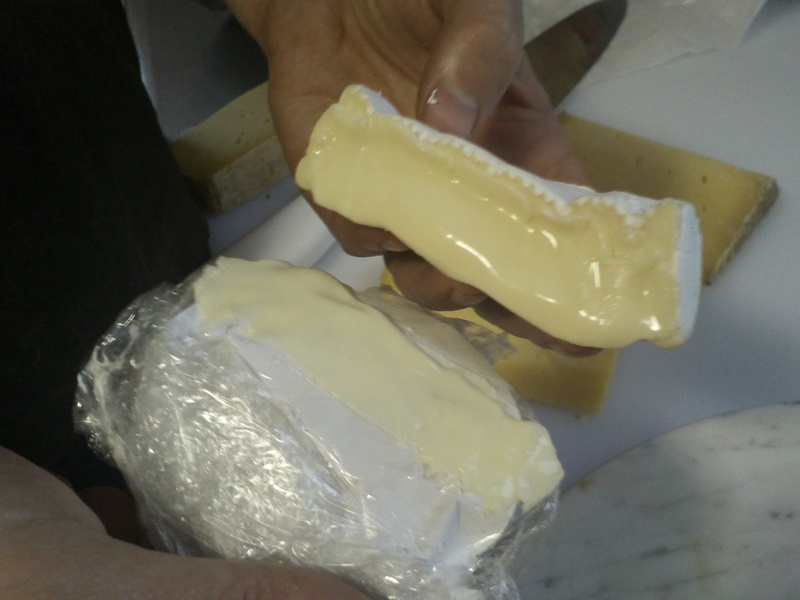 The longer the cheese stays in plastic, the more ammoniated the rind will become, eventually affecting the entire paste of the cheese. Should you notice a bloomy rind cheese beginning to get hard to the touch and the rind turning from white to a grayish brown, the cheese is probably not going to taste very pleasant, let alone be in its best condition. Bloomy rinds should stay soft to the touch. The best packaging for bloomy rind cheeses is a two-ply paper which has a layer of perforated plastic on the outside and a layer of thin paper underneath it so the mold can breathe. A solid plastic will suffocate it. A perforated plastic without the paper will also suffocate it because the mold grows into the perforation preventing air passage. A hard or natural rind cheese may hold up better to sitting in plastic wrap, but up to a half inch of the face of the cheese will be lost in flavor. Yikes! Let’s get this one rewrapped straight away. If you choose to buy a cheese wrapped in plastic wrap, there are a few things you can do when you get home that will help to preserve the cheese. First, only buy a cheese that has been cut, at most, within a few days of the date on the package. Unwrap the package immediately when you get home. Gently scrape off a thin layer of the exterior of the cheese to remove any unpleasant flavors, aromas, or toxins that the cheese may have incurred. This is what is called “facing,” which a good cheesemonger will do everyday to every cheese to insure each cheese is in good condition to taste. Let the cheese come to room temperature before you enjoy eating it. 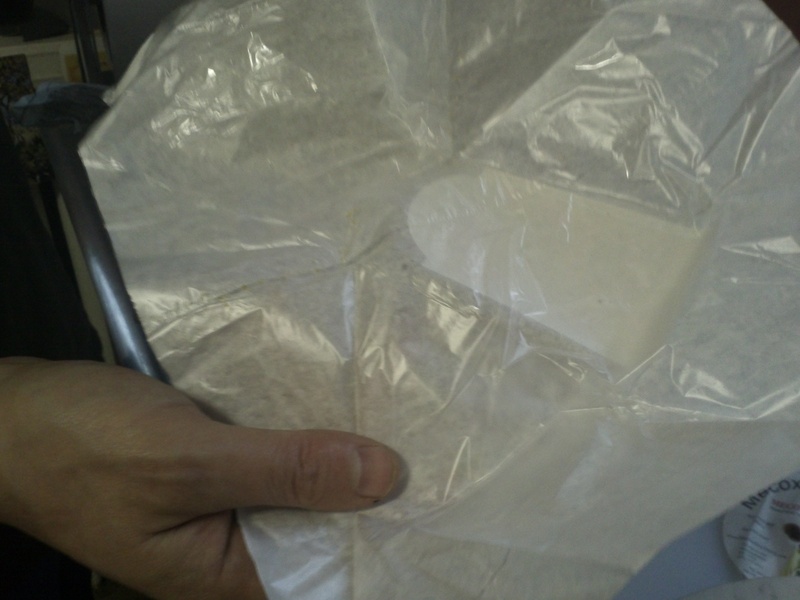 If you will not eat the cheese right away, rewrap it in parchment paper and place it in an airtight container. Refrigerators preserve food by keeping the environment dry. Cheese likes humidity. You can even place a wet paper towel folded in the corner of the container to add moisture. An airtight container will keep the humidity in and unpleasant refrigerator odors out of your cheese. This entry was posted in Uncategorized and tagged cheese, cheese paper, plastic, saving store bought cheese by The Cheese Traveler. Bookmark the permalink. Hi Eric, I enjoy reading your posts. I am not sure if you of aware of this, but each time you include photos they are enormous as you will see below. Please look into properly sizinh them, they are distracting this way and I bet most people stop scrolling after one or two of these. Hope this is helpful!